Jeff Nichols' third feature film 'Mud' is many things, a crime film, a drama, a thriller, a comedy, a coming of age film but above all, 'Mud' is brilliant. The film poses one of the most intriguing and enthralling premises I've seen for a tale of youth naivety and growing up that I've seen a long while and Nichols manages to get the very best out of all aspects of the film and creates an experience to remember. The tale of two young boys who discover a fugitive living in a boat in the trees of a Mississippi island and are determined to help him escape those who are hunting him and to return him to the woman he loves. The genre of coming of age films has been done many, many times over the years and in countless of different ways, but for some reason 'Mud' seems so fresh and original. Now, I know that this film isn't exclusively a coming of age film but it still does a better job a telling a realistic tale of growing up. The characters of Ellis and Neckbone really embody to naivety of youth, even when the two are aware of Mud's past they continue to help him out so that he can return to his girlfriend, Juniper, simply because they love each other. Things like this may sound a little too sentimental for some but the way in which Nichols handles it makes his film exude charm and likability. 'Mud's folk tale like approach to its narrative that mixes with its realism gives audiences the sense of the line between reality and fantasy being blurred. Its admirable when a film even attempts to dip into both worlds but when it is able to reach success like this then it becomes all the more admirable. Fashioned as a story you may hear around a camp fire, utilizing it's southern setting to its full advantage as its factual location is the perfect backdrop for fantastical events. It's incredible to hear the story of how 'Mud' came to be. 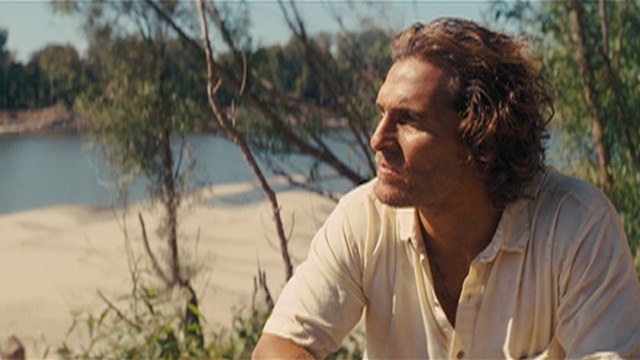 Nichols envisioned the film as a student, even the casting of McConaughey, and was inspired by the novels of Mark Twain. You really get a sense of the passion with which Nichols is assembling the film with, I always love hearing stories of filmmakers who get the chance to creates projects they dreamed of when they were younger and this gives me an even deeper appreciation for this film. As I have alluded to many times above, the film is incredibly well Directed by Nichols he's execution of the realistic folk tale is really incredible. Another highly impressive aspect of film making here is Nichols screenplay, there were a couple scenes I really could have done without but overall I thought the script was just excellent. Also, Adam Stone's Cinematography is absolutely awe inspiring capturing the inner beauty of South. If a few years ago you were to say that Matthew McConaughey was going to become a great and important actor, you probably would have been laughed at in the same way if you said that Ben Affleck was going to become one of America's finest filmmakers. If his phenomenal turn in 'Killer Joe' last year, solidified his remarkable career turn around then his performance in 'Mud' could label him a future Oscar winner. McConaughey is phenomenal here as the loveable and enigmatic Mud, from the moment his character appeared on screen I became invested in the film and his performance, truly great stuff from the man and I really hope he can keep this hot streak up. The two young actors Tye Sheridan and Sam Shepard are incredible as well and really help make this film as good as it is, the interaction between McConaughey and the kids is one of the films greatest traits. Reese Witherspoon does a decent job too in a role which doesn't allow her to do a hell of a lot and I damn near jumped out of my chair when I found out that Michael Shannon was in this, that guy's so awesome. I came into 'Mud' with really high expectations and I am thrilled to say the film really lived up to them. A truly beautiful, emotive and charming coming of age film that is terrifically crafted and well performed. Destined to be one of 2013's best films.